Southern Sampler - The grandeur of the South unfolds before your eyes on this glorious and enlightening trip along the waters of the Lower Mississippi River. 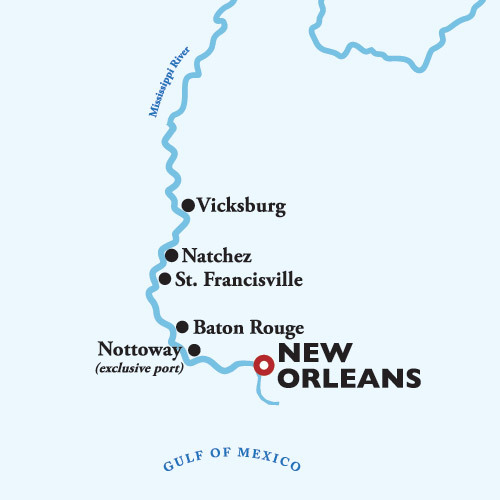 From the vivacious vibes of lively New Orleans to sprawling antebellum mansions steeped in history, experience the diverse culture, stories, songs, and flavors of the region. Learn the lore of this hallowed route from lectures and chats with our resident Riverlorian, and catch a glimpse of life before the Civil War at the famed Nottoway Plantation. Each night, you’ll enjoy the Broadway-caliber talents of our onboard entertainers. See what awaits around the next bend on this captivating voyage. Port Charges of $199 per person are additional and not included in the fare.